Today, I thought it would be fun to share a look into my glamorous life as a housewife! The blogger/reader relationship is a very strange one. While we read blogs every day and feel like we really know this person, there's so much of a blog writer's life that is edited out because it's not...well...blog worthy! So, here's a typical Tuesday. Not very blog worthy but this is me in my natural habitat and it's how usually spend a weekday. I get a lot of questions from other moms about how I find time to do my hair and makeup and get dressed every day so here's some of that too. My house is usually messier and sometimes getting my kids to wear clothing is a challenge but other than that, this is pretty much it! I wake up and get dressed, then make breakfast for the kids and I. Since I made a big batch of oats yesterday, a quick, healthy breakfast is easy. I instagrammed today's fabulous hair. It turned out pretty good so once I get a few more tries at it, I'll share a tutorial. Today I wore my first vintage dress, just a simple 50s cotton dress. It's pretty plain so I don't wear it outside the house much but I love these comfy easy dresses for days like this. Although I did myself the favor of washing dishes last night instead of letting them pile up, there's breakfast clean-up to do and a kitchen to tidy up so I put True Blood on my kitchen tablet (using this awesome free app called ShowBox for Android) and get my dish-washing on while the kids play in the living room. I almost finished my mountain of laundry yesterday but there's a few more clean loads to put away. I haul them up my terrifyingly narrow and steep basement stairs and get to work. Not long after, I am joined by Rhys in a life jacket and knight's helmet. He's pretending to be "Baymax 2.0" from Big Hero 6. Since its the beginning of the week, I boil some eggs. The kids love to snack on them, have them in lunch and my husband, Pj takes some to work for a quick and easy breakfast on the road. I waste time on social media while I wait for the eggs to be ready. After peeling eggs, the kids are starving and it's time for lunch. They harass me about what kind of cheese I put on their grilled cheese sandwhich and I make them awesome, gorgeous bento style lunches while I devour my BLT wrap as I stand at the counter. Also, I really do wear aprons every single day. That wet skirt down there is proof of my wiping hands on lap habit. I put a few of those hard boiled eggs into a really fun fish-shaped egg thingy. Isn't that delightful? They eat while I clean up the mess and they ask me questions like "What does Harmony mean?" I check the mail and it's just junk to toss in the recycling bin. The kids go crazy in the living room with a blanket tent, which they build basically every day. They also build excellent forts using the sofa cushions until I tell them that's not acceptable and they need to put the cushions back. After lunch, Olivia says she's tired and would like to watch a show and lay down in bed. Rhys decides to join her so I get a little quiet time working on my blog posts for the week. I like to pre-write stuff and add photos in later to manage my time. Since housework and messy things are over, I hang up my apron for the day. I watch paranormal documentaries and make a tiny retro reindeer for a Christmas craft e-book that I'll be releasing later this year. Pj comes home and changes into relaxing clothes. He's a roofer so days are long and hot and he just wants to be comfy! He cooks dinner while I finish my deer. Sometimes I cook, sometimes he cooks, sometimes we cook together. He loves to cook and finds that it helps him to unwind after a long day so I let him have at it! We watch Monster Quest and snuggle on the sofa for a while after dinner. Its 7:30 and the kids are in the tub. 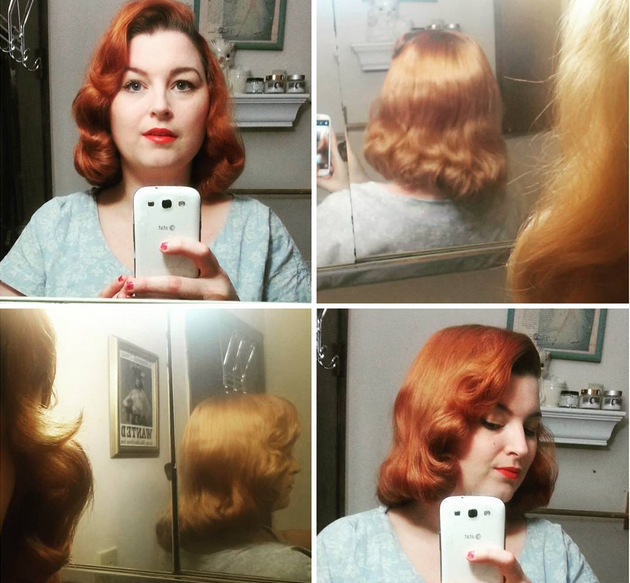 I pin curl my hair and wash theirs. Teeth are brushed, night cream is on and it's time for tucking them in and giving goodnight kisses. It's 8:00 and we're absolutely wiped out. I do a run-through of the house to shut lights off and do a very quick tidy up so we have a fresh start tomorrow morning. I spend the evening before bed watching stand-up comedy with Pj. I hope you enjoyed a peek into my week day. I'd love to see yours! I love day in the life posts. Thanks for sharing your day! Can't wait for the ebook, such exciting news. Where did you get those awesome clips for your curls? This is so much like the articles I've read in old Ladies Home Journals in their series How America Lives. Your reindeer is so cute! Will you have any for sale in your Etsy shop? Terrific, instantly engaging post. It reminds me a feature that Life magazine did on the daily going ons of an average mid-century housewife back in the day (have you see it before? ), but obviously with plenty of 21st century touches in your timeline here. Thank you for the intimate, really enjoyable look into your life, Brittany. I love looking into fellow retro housewives lives! Got a quick tip for you from a very TIRED housewife....wear shoes! Even if it's just a pair of house shoes. I've always been a "barefoot bandit" (not a very nice nickname if you ask me), but after years of spending so much time on my feet working around the house, my poor feet took a toll. Now, during the summer months I'll wear thicker flip flops or tennis shoes while during housework (but of course change them before going into public), and during the winter I wear a fabulously hideous yet unbelievably comfortable pair of Ugg house shoes the husband bought me for Christmas last year. You'll be amazed at the difference it makes on your toesies! This all sounds so familiar! ;) Mine are still little enough that they need a lot more hands on attention, but it's nice to see how other people "manage", too. I'd love to be able to find the time to set my hair regularly again.